People who have diabetes also tend to get skin infections (both bacterial and fungal) that can occur on any area of the body. If not treated timely, even minor skin problems can lead to serious complications because diabetes slows the process of healing. Diabetes mellitus (DM), commonly referred to as diabetes, is a group of metabolic disorders in which there are high blood sugar levels over a prolonged period. Symptoms of high blood sugar include frequent urination, increased thirst, and increased hunger. Diabetes can cause many complications. Acute complications caninclude diabetic ketoacidosis, hyperosmolar hyperglycemic state, or death. Serious long-term complications include cardiovascular disease, stroke, chronic kidney disease, foot ulcers, skin problems and damage to the eyes. In fact, health experts recommend that diabetic people should take good care of their skin, as diabetes can cause a number of skin problems. Good management of one’s blood sugar (glucose) levels requires for staving off skin problems. People who have diabetes also tend to get skin infections (both bacterial and fungal) that can occur on any area of the body,including between the toes, around one or more of the nails and on the scalp. If not treated timely, even minor skin problems can lead to serious complications because diabetes slows the process of healing. This is why it is very important to learn about the common skin problems associated with diabetes. This skin problem is characterized by darker skin in the creases of the neck that feels like velvet. In fact, this is one of the first signs that you may have diabetes, as it occurs due to insulin resistance. Apart from the back of your neck, acanthosis nigricans can affect the skin on your armpits and groin. Less commonly, it affects areas like the face, inner thighs, elbows, knees and navel. 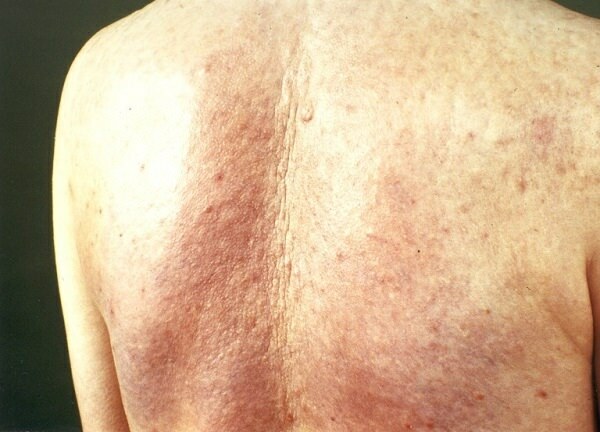 No specific treatment is available for acanthosis nigricans. Treatment of underlying conditions may restore some of the normal color and texture to affected areas of skin. Obese people with diabetes are at a higher risk of developing this condition. So proper exercise, losing weight and controlling your blood sugar level is the best way to reduce the risk of developing 'acanthosis nigricans'. A dermatologist can also help you find out what’s causing your discolored skin. Moreover, acanthosis nigricans can also be triggered by certain medications such as birth control pills, human growth hormones, thyroid medications, and even some bodybuilding supplements. All of these medications can cause changes in insulin levels. 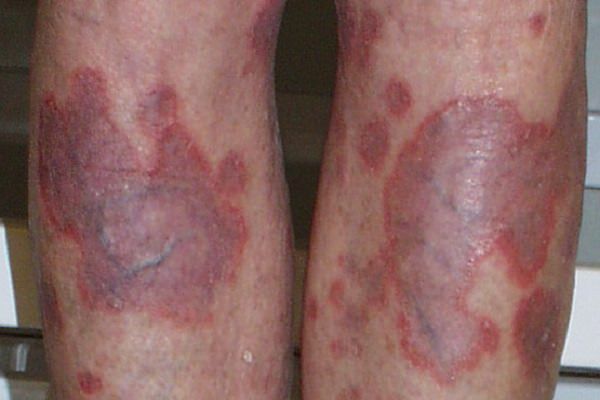 This is another common skin disease in people diagnosed with diabetes. It is caused by changes in the blood vessels and is very similar to diabetic dermopathy. It generally affects the lower legs, where the skin becomes raised, yellow and waxy in appearance. 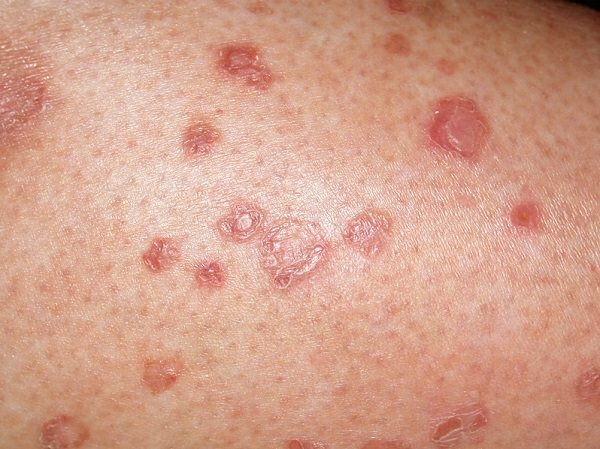 Over time, the lesions develop a purple border and can even cause scarring become itchy and painful. This condition may have active and dormant periods, depending upon how well you control your blood sugar level. There is no clearly defined cure for Necrobiosis. NLD may be treated with PUVA therapy and improved therapeutic control. Although there are some techniques that can be used to diminish the signs of necrobiosis such as low dose aspirin orally, a steroid cream or injection into the affected area,this process may be effective for only a small percentage of those treated. People suffering from type 1 diabetes can have digital sclerosis, which means thick, tight, waxy skin that develops on the back of the hands and the joints of the fingers. Along with the skin on the back of the hands, the skin on the toes and forehead can be affected. Sometimes, the thickening skin spreads to the face, shoulders and chest. Keeping your skin moisturized can help soften it, but controlling your blood sugar level is the only treatment for this problem. 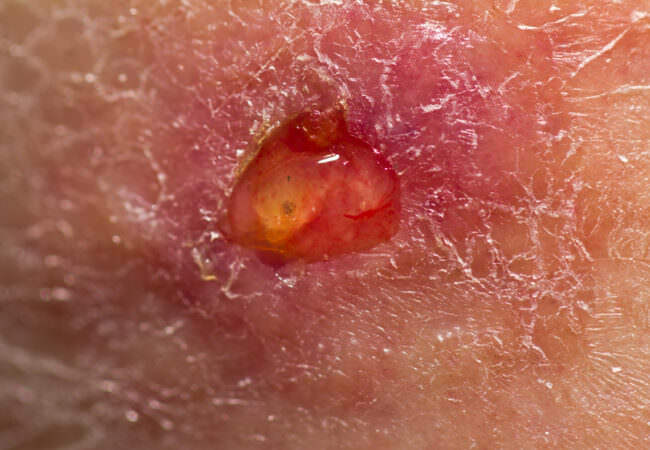 Uncontrolled diabetes can cause eruptive xanthomatosis, which is characterized by firm,yellow, pea-like skin growths. These small bumps have a red halo around them and cause a lot of itching. It usually occurs on the back of the hands, crook of the elbows, feet, arms and buttocks. Apart from diabetes, people with high cholesterol and very high triglycerides (fat in the blood) are at a higher risk of developing this problem. If you are diabetic, do your best to get your blood glucose levels down, as it is the main treatment for this problem. By controlling blood sugar level, the skin eruptions will disappear within a few weeks. Treatment involves getting your triglyceride,cholesterol and blood glucose levels under control. Doing so might require the use of lipid-lowering drugs (such as statins like Lipitor® or Zocor®) or fibrates (such as TriCor® or Lopid®). 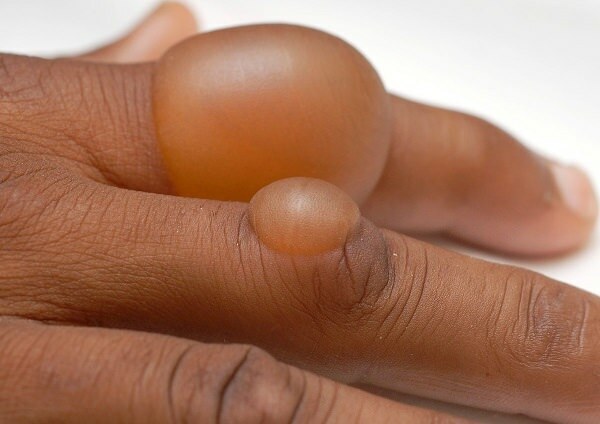 It’s also known as diabetic blisters, this skin problem can occur on the back of the fingers,hands, toes, feet, and sometimes on the legs or forearms. These blisters may occur alone or in patches and resemble burn blisters. However, they are not very painful. People who have severe diabetes and diabetic neuropathy are at a higher risk of suffering from this problem. Like any kind of blisters, diabetic blisters can cause infections if the problem is not addressed. Keeping your blood glucose level under control is the only treatment for these blisters. In this type of skin condition, also known as shin spots, spots develop that create a barely noticeable depression in the skin. It happens as a result of changes in the blood vessels that supply blood to the skin. The spots usually develop on the shins, but can also occur on the arms, thighs, trunk or other areas of the body. Shin spots do not hurt, but rarely, they can be itchy or cause burning sensations. As the spots typically cause no symptoms, people often mistake them for age spots. But unlike age spots, shin spots usually start to fade after 18 to 24 months. However, if your blood sugar is not controlled, the spots can remain indefinitely. Generally, the skin lesions of diabetic dermopathy often improve over time. Keeping skin moisturized and trying to avoid any injury to the legs should help prevent the development of some lesions. This is another common skin problem in diabetic people. It causes raised, bumpy or ring-shaped spots that may be skin-colored, red or reddish-brown. The spots most often develop on the fingers and ears, and may cause mild itching. In some cases, the spots can occur on the chest and abdomen. They can be isolated or numerous on the body. Once your blood sugar level is under control, the spots usually disappear on their own without leaving scars. Because granuloma annulare is usually asymptomatic and self-limiting with a course of about 2years, initial treatment is generally topical steroid creams such as hydrocortisone, followed by oral steroids and finally intradermal injections at the site of each ring. Treatment success varies widely, with most patients finding only brief success with the above-mentioned treatments. New research out of India suggests that the combination of rifampin (600 mg), ofloxacin(400 mg), and minocycline hydrochloride (100 mg) once monthly, or ROM therapy, produces promising results. 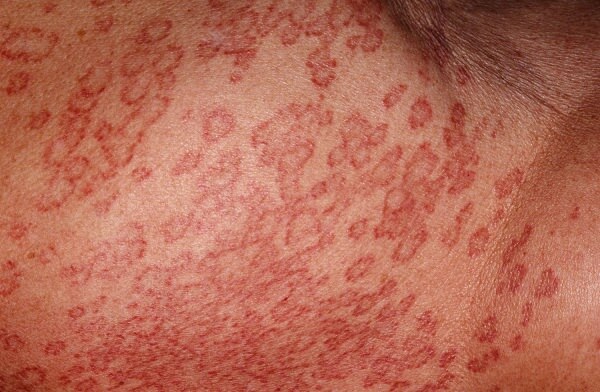 Sclerederma diabeticorum is a rare connective disorder occurring in diabetics due to poor metabolic control. It is characterized by thickening of the skin on the upper back area and back of the neck. It can also occur on the face, neck and trunk. The hardening of the skin makes it firm with slightly red or brown “woody plaques”. The disease usually progresses slowly over several years. With time, it tends to decrease sensitivity in the affected area and reduced motility in the neck and shoulders. It is characterized by thickening of the skin on the upper back area and back of the neck. It can also occur on the face, neck and trunk. The hardening of the skin makes it firm with slightly red or brown “woody plaques”. The disease usually progresses slowly over several years. With time, it tends to decrease sensitivity in the affected area and reduced motility in the neck and shoulders. For proper diagnosis of this condition, your doctor will advise you to get a skin biopsy done. •	Get immediate medical care for an open sore or wound. •	Work with your doctor to better control your diabetes. The best treatment option for most diabetes-related skin conditions is managing blood sugar levels through a proper diet and any necessary lifestyle changes. Whether you are washing your hands or taking a shower or bath, dry yourself thoroughly. Take special care to dry the areas between your toes under your arms and anywhere else where moisture can accumulate. Use a good quality moisturizing lotion to keep your skin soft and hydrated. It is best to apply a moisturizer right after you shower to help the lotion penetrate deep into the skin. Drink an adequate amount of water throughout the day to keep your body hydrated and your skin moist and healthy. Always wear loose-fitting underwear made from cotton to help allow good flow of air. It is best to wear comfortable socks and shoes to take care of the skin of your feet. Eat a healthy diet that includes more fruits, vegetables and whole grains. Exercise regularly. Aim for 30 minutes of cardio exercise, 5 days a week. Monitor your blood sugar level regularly. Avoid scratching dry skin, which can create lesions and allow infections to set in. Treat cuts and bruises immediately, no matter how small they are. Avoid hot baths or showers, which can dry out your skin. Use talcum powder to keep skin folds dry. Regularly check your skin thoroughly. If you notice any unusual signs see your doctor immediately.